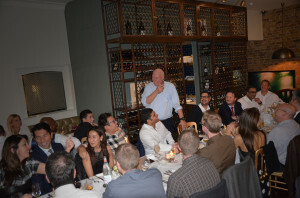 I am taking a departure from my usual MBA Blog to write about an amazing evening I had recently, in the company of perhaps one of the most successful CEOs in the field of horology there has ever been. What’s horology you ask? Well it’s all to do with watches. Watches are big business, a big multi-billion dollar business. 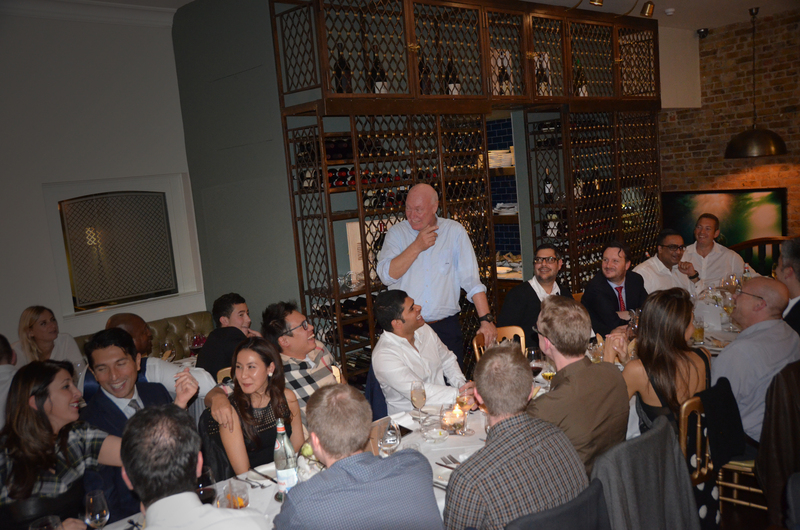 About a month ago, I was asked if I would like to attend an event organised by Hublot, to have dinner with a man named Mr Jean Claude Biver. Now, you probably haven’t heard of him, so let me give you a brief biography. He is kind of a big deal in the world of watches. Jean Claude Biver was born in 1949 in Luxembourg and in 1981 he bought the rights to a failed watch company known as Blancpain. He bought the rights for around $25,000, and in 1992 sold them for $43 million. He then joined Omega, secured placement of Omega watches in the James Bond movies, and signed Cindy Crawford, Michael Schumacher, Pierce Brosnan, as well as NASA, to the brand. In 10 years he tripled their sales. He then joined Hublot, at the time a poorly performing watch company, and in three years increased their sales by a factor of five. Subsequently Hublot was bought by Louis-Vuitton-Moet-Hennessy for a very large sum, making Jean Claude’s minority stake worth tens of millions. In summary, the man is a genius, and there is so much to be learnt from just sitting next to him and having a conversation about his attitudes towards business. Fortunately, that’s exactly what I did, and I think a lot of what I learnt from him can be applied to anything. One of the key things to being successful, he told me, was PASSION. Some people are born with passion, and with passion comes CURIOSITY. Without these things, one cannot be successful. If you are in a job that does not spark passion in your soul, then you are in the wrong job. I have been thinking about this and comparing it to the dentists I know. Some are happy to turn up nine to five, do their job, and leave. To them it’s just a job, not a passion. But, then there are those who are passionate about their work, they become totally immersed in it, and as a result, usually become very successful. So I suppose it’s a bit like education really? Do we qualify, and start working flat out straightaway, making money. Or should we invest something in ourselves and start to learn new skills and techniques, perhaps even going down a path of post-graduate education. In essence, we are acquiring more hammers! Dr Nilesh R. Parmar BDS (Lond) MSc (ProsthDent) MSc (ImpDent) Cert.Ortho was voted Young Dentist of the Year at the 2014 Dental Awards and Best Young Dentist in the East of England in 2009 at the Dentistry Awards. He is also voted 18 in this year’s Dentistry Top 50. He was shortlisted at the Private Dentistry Awards in the category of Outstanding Individual 2011 and received Highly Commended for Best Dentist South at the 2013 Dental Awards. Currently studying for his MBA at Imperial College, London, Nilesh runs a successful seven-surgery practice close to London and is a visiting implant dentist to two central London practices. Nilesh has a never-ending passion for his work and is famed for his attention to detail and his belief that every patient he sees should become a patient for life. 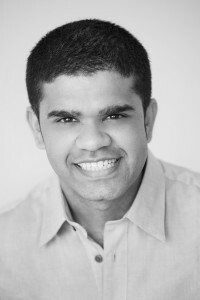 He offers training and mentoring to dentists starting out in implant dentistry, more information can be found on his website www.drnileshparmar.com. As he prepares to return to study for his MBA after his Summer break, Nilesh Parmar reflects on the last few months of his time at Imperial College and all that he has learnt about running a business! The entire dental team is continuously facing new challenges, from regulations and managing patient expectations, to keeping up-to-date with the latest techniques and product developments. Additionally, many forget that the dental practice is a business and like any other business it needs to be well managed. However, after dental school, we leave with no formal training in business or economics, thus establishing and running your own practice can prove challenging. This is why as a “Young Dentist” (not sure I can say that for much longer) I decided to embark on a 2-year MBA so that I could gain the necessary skills to run, manage and understand the practice(s) I work within. So how have the past 6 months been? Eye opening, tiring, difficult, inspiring – all of the above! The College eased us into our first year, as we were introduced to the programme and I was looking forward to learning about Managerial Economics (that’s tough stuff), Financial Management and Accounting (even tougher stuff), Marketing Management (the fun stuff) and Organisational Behaviour (that’s scheduled for next term)! It wasn’t too difficult to get back into the mindset of a student with the fancy iPad Airs we were handed and it certainly eased the blow when we were thrown into the accounting element of the programme. And oh boy, I now have a newfound respect for my accountant – it’s HARD! Do you know what a ‘deadweight loss’ is? What ‘gearing’ means? How do you work out EBITDA? Neither did I!! It wasn’t long before we had our first group project, focusing on using KPIs (Key Performance Indicators) to assess which of the UK supermarket chains an institutional investor should put their money into. It was a bit different to deciding if a tooth is hard to extract or not, but that’s why I enjoy doing my MBA, it’s completely different to what we do as dentists. Term one concluded with this comment from my tutor. “If you think this term was difficult, wait until term two – You haven’t seen anything yet Nilesh!” *Queue dramatic music*. Term two: …the tough gets going! It started on a positive; I passed my Harvard Quantitative Methods online course, however, I sometimes found myself asking, “Why am I doing this again?” Exams were looming and we had a lot of coursework due! But just before the Summer break my enthusiasm was reignited as we got stuck in with marketing and had to pitch a marketing plan for a product of our choice. My group worked on a new Instagram based geo-tagging app called ‘Loci’, as we decided this might be easier to sell and promote to the crowd. We created a teaser video for our presentation, which we sent out to all group members via WhatsApp and delivered subtle messages to spark the interest of the audience. We used guerrilla marketing and had everyone downloading the app, giving anyone who did, some chocolate as a reward! Unfortunately though we were defeated! So what have I learnt so far? The MBA has broadened my horizons and made me think outside the box. We have had sessions on how to negotiate, about price structure and how to develop our knowledge further in team management. I certainly feel it’s becoming even more beneficial when I’m bringing the newly collected information back to the dental environment. First of all, you may remember the Harvard Quantitative methods online course I had to do? Well I PASSED! Small victory for me (as I punch the air)! Every degree I have done, there has been a “WHY?” moment. This is usually before the exams, sitting in my study longingly looking out of the window at the summer weather (exams are always in the summer, it’s just cruel). Watching everyone outside enjoying themselves, and me… drowning in a mountain of textbooks and paperwork. Why am I bothering, what difference is this all going to make in the long run? Well in order to succeed, you really need to put your heart and soul into it; you need to believe it’s going to make a difference; otherwise mentally you are destined to failure. In my eyes, doing this degree is going to give me a back-up plan, an alternative income stream. I will have the tools to hand to make a living, not just by drilling teeth but by doing something completely different. I used to envy my friends who did a non-vocational degree at university. They would do a maths degree and end up working in real estate, or a biology degree and end up in marketing. As dentists we are only trained to do one thing, teeth stuff! That’s it! So, what have I been up to? Well exams are looming, and I am rather worried! It’s a lot of material to cover. We have coursework due in based on social networks in the workplace. At first I thought, what a load of nonsense, but after looking at the data we collected and using social models to analyse and interpret the data, it’s actually quite fascinating! I think this stuff could actually be applied to… wait for it… dental practices! So it is relevant! My course group are a very hard working bunch, we are definitely dedicated to the cause, and through our WhatsApp group we are encouraging and supporting each other as best we can. I am beginning to feel that it’s not so much the destination with this degree, it’s the journey, and how it is slowly changing the way my thought processes work. Dr Nilesh R. Parmar BDS (Lond) MSc (ProsthDent) MSc (ImpDent) Cert.Ortho was voted Best Young Dentist at the Dental Awards 2014 and Best Young Dentist in the East of England in 2009 and runner up in 2010. He was shortlisted at the Private Dentistry Awards in the category of Outstanding Individual 2011 and received Highly Commended for Best Dentist South at the 2013 Dental Awards. Comments Off on MBA Blog 4: Why am I doing this again? To put it into perspective, for me personally, it’s more work than my two Masters Degrees put together. Yes, that much! I think the explanation for this is that it’s a very different topic to what I’m used to. Doing dental post-grad is easier, since the terminology used isn’t alien. We already know what an implant and an ortho bracket are. We certainly all should know what a BPE is as well! But MBA jargon is very different. We are well into the Accounting part of the programme, and (oh boy! ), I now have a new-found respect for my accountant. Accountancy is HARD! Do you know what a ‘deadweight loss’ is? What ‘gearing’ means? How do you work out EBITDA? So this is the issue… there’s a lot of brain re-wiring that needs to be done in order to continue with the course and I believe you have to be open to making this change. To be honest, I am going to re-jig my work commitments to let me focus more on this stuff than teeth. So what have I learnt so far? Well, I don’t have time to go into all of it here, but to somehow simplify what’s been going on… It has broadened my horizons and made me see the bigger picture. We have had sessions on how to negotiate, about price structure and how to develop our knowledge further in team management. It has been very useful, and I certainly feel it’s becoming even more beneficial when I’m bringing the newly collected information back to the dental environment. We have regular quizzes, which count towards our final grade. This of course means, every week, there’s the crucial need for some serious study time. In dental post-grad you can do an intensive amount then almost (sorry to say this) ease the pressure on the accelerator for a few weeks. Not with an MBA! At the moment I have two quizzes to revise for, a few telephone meetings, two sessions of group work and the pre-reading for the University sessions next week. Sleep? Who needs sleep? I have my accountancy textbook to keep me awake! Dr Nilesh R. Parmar BDS (Lond) MSc (ProsthDent) MSc (ImpDent) Cert.Ortho was voted Best Young Dentist in the East of England in 2009and runner up in 2010. He was shortlisted at the Private Dentistry Awards in the category of Outstanding Individual 2011 and received Highly Commended for Best Dentist South at the 2013 Dental Awards. Comments Off on My MBA Blog 2: So what have I learnt so far? I hear this a lot from patients. Usually they were told this some time ago, and at the time it was probably true. Dental implants require bone to be placed, without the bone the implant would just float about and come out, being not much use to anyone. So the bone… What happens to it? Where does it go? Once a tooth is removed, the bone will start to resorb (disappear). That’s the body’s reaction to losing a tooth; the bone is only there to keep the tooth in place, and without the tooth, there is no reason for any bone. How long does it take for the bone to disappear? Well that’s really tricky to say, as some patients seem to maintain bone very well, despite the period from when the tooth was removed. Others seem to lose bone VERY fast, usually within a few months. The upper jaw is usually worse affected, due to the upper sinuses putting pressure on the ridge of bone. Think of it as real-estate, the sinuses (the air chambers in your head) which are above your teeth, want to acquire more space, and once the teeth are gone, the sinus will expand to occupy more room, in order to do this, you lose bone. If this does happen, we take back some space by carrying out a ‘sinus lift’ (I will explain this within a future post). As dentists, we can replace human bone with substitutes. These can be from yourself, your own bone; we’d cut a chunk out of your hip or your lower jaw, and bolt it onto the area that’s lacking. This is a bit dramatic (yes that face you just made… that’s what my patients usually do when I offer this service). It is useful in areas where A LOT of bone is missing. It’s considered big surgery and requires some careful thought. Thankfully, this isn’t very common; most patients require simpler bone graft procedures. This can be using an artificial source of bone, which comes from a lab (totally artificial) or an animal. When the animal bone reaches the dentist, it’s not a lump of cow or pig. It’s almost a fine crystal. Think of rock salt, and you will be close. This is the inorganic part of the bone, which has been treated to remove all organic material. It is mixed with blood or saline and added to the deficient site. Once added, it is covered with a membrane to stop the gum growing into it, acting as a barrier. Over time this is said to form ‘bone’. I put bone in inverted commas, as it depends what your definition of bone is. In my opinion, this stuff doesn’t always form hard solid bone, as we would associate with the word, but a softer halfway house. Research has shown this to be an effective alternative to using blocks of your own bone. The technology in this field is developing at an accelerated rate, and hopefully one day soon, we will be able to take some cells from you, grow your own new bone in the lab and then re-introduce it into the deficient site. The possibilities are endless, but the best part is that all these developments will ultimately benefit the patient. Dr Nilesh R. Parmar BDS (Lond) MSc (ProsthDent) MSc (ImpDent) Cert.Ortho was voted Best Young Dentist in the East of England in 2009 and runner up in 2010. He was shortlisted at the Private Dentistry Awards in the category of Outstanding Individual 2011 and received Highly Commended for Best Dentist South at the 2013 Dental Awards. Nilesh has a master’s degree in Prosthetic Dentistry from the Eastman Dental Institute and a master’s degree in Clinical Implantology from King’s CollegeLondon. He is one of the few dentists in the UK to have a degree from all three London Dental Schools and has recently obtained his Certificate in Orthodontics from Warwick University. His main area of interest is in dental implants and CEREC CAD/CAM technology. My MBA: Getting back to business (school)! I am stupid. No, I really am! I seem to enjoy making myself suffer. There I was during the end of 2013, and my life was pretty good. I was an implant dentist, working at my own practice in addition to being a visiting implant dentist (this is a good thing) to another London-based practice. I worked in continuous alternation, with four days one week and six days the next. I made enough money to pursue all my hobbies and interests, whilst being able to save some for what would be an early(ish) retirement. Do you believe you know all you need to know about business? Do you feel you have the necessary skills to run, manage and understand a business? I know I don’t! I can do teeth, and I’ve spent almost half my life dedicated to these silly little white things people have in their mouths. However, this hasn’t prepared me for running one, two or even a hundred dental practices. It hasn’t prepared me to understand balance sheets, marketing or accounting. I believe that this is a huge flaw in the current dental undergraduate programme and it’s something which completing an MBA will help me become more knowledgeable in. I’m no stranger to post-graduate education. After dental school, I completed two Master’s degrees and then did a one-year programme at Warwick University. BUT, the difference is, and I think this applies to a lot of people who choose to do MBAs, that I have no formal training in business or economics. My main intention for this blog is to provide readers with a first-hand account of the MBA experience at a leading London University from my perspective. If there is a lot of interest I will update this as often as I can, and will even include a few hints and tips in order to survive the MBA process! We meet on two Fridays a month with the odd few days here and there. My aim is to take every Friday off and work on my MBA with the necessary evenings and weekends dedicated to it as required. I will not be reducing my clinical workload as of yet. What I must say, is that the organisation and the structure of the programme has so far been great. There are 37 of us in the group and we are all slowly beginning to bond (with a few characters starting to stand out), and I think it will be an enjoyable two years. So what did we do in the first week? Well, we started early and finished late; attending numerous lectures. No handouts were required as we followed it all on our University-issued iPad Airs (fancy)! We were provided with an effective combination of group work and individual projects, and I particularly benefited from a great team building exercise where we all contributed to designing, developing and shooting an advert for a fictional app. It was like being on The Apprentice. My impressions so far is that out of all the studying I have ever done, I think the MBA will be the hardest. I say this as we are not solely just students, we all have full time jobs, careers, friends and families (in a lot of cases, new born babies and young children)! So ultimately, it will be a challenge. But what a challenge! I have a feeling that it’s already making waves and influencing the way I now think and do things in practice. This can only be a good thing… right? Comments Off on My MBA: Getting back to business (school)! Raise Money at the Ice White Charity Xmas Party! The Ice White Charity Xmas Party is back! Bigger and better for 2013, Dr Nilesh R. Parmar invites you all to jump on board HMS President, permanently moored along London’s Embankment, on Sat 14th December 2013 and help raise money for this year’s charity – Operation Christmas Child (OCC). celebrate the start of the festive season and raise money for charity, Nilesh is excited to see the return of the Ice White Party. This year you can expect all of the same entertainment plus much more, as Ice White promises plenty of champagne to sip, live entertainment and the return of the raffle, where guests can win some fantastic generously donated prizes. Plus, there’s an after party ‘til 4am at Carriage 34, a new members club near Waterloo. Kindly sponsored by Digimax, Manan Ltd, NSK, Enlighten, Quick Straight Teeth, Navigation Wealth Management, Bredent, The Riverbanks Clinic and Genuine Solutions Group, tickets to this exclusive event are £10. Don’t miss out… reserve your space on the Facebook event page or email drnileshparmar@gmail.com and don’t forget to wear white (or silver)! Thinking of having a baby… see your dentist first! Crazy thought right? Well not really. There is now research being put forward linking poor oral health with fertility issues. One study in The Journal of the American Dental Association found that pregnant women with chronic gum disease were four to seven times more likely to deliver prematurely (before 37 weeks) than those with healthy gums. Women in the group with more severe periodontal disease delivered even earlier (before 32 weeks). So whats the recommendation? Well, it’s to see your dentist for a full examination and assessment of your gum health BEFORE you and your partner start trying for a little one. Make sure, when you do see your dentist, you tell him/her your plans and that you are trying to become a mum. This is the time to find out if you have any high-risk teeth which may need work doing in the near future. Perhaps, ask if there are any radiographs (X-rays) that could be taken at the appointment. The other reason, I want all you future mothers to come and see me (other dentists are available) before you fall pregnant is that, pregnant woman can be tricky patients to manage. Realistically, when a pregnant lady sits in my dental chair, I want todo as little treatment as possible. The guidelines suggest that dental treatments such as fillings, extractions and even radiographs are ok in the second trimester, since most of the foetal development occurs in the first trimester. However, I try not to take ANY radiographs at all. Irrespective of which stage of pregnancy you are in. In certain circumstances, we have no choice and some emergency dental treatment needs to be carried out. Most dentists can usually figure out the cause of tooth pain, and treat it without a radiograph (this is not ideal)! Deferring any further treatment until after you have delivered the little one. Lignocaine, which is the numbing agent we use, can pass the placental barrier, but there have been no known negative side effects. Antibiotics such as amoxicillin have been classified as safe to administer. As for elective treatments such as dental implants, tooth whitening or veneers. Forget about it! Wait nine months and then come back, the treatment can still be done after this time, with no risk to your baby. During your pregnancy, you will enjoy morning sickness, cravings (interestingly not many of my patients report strange cravings), and you may get pregnancy gingivitis. This is gum disease related to hormonal changes experienced during pregnancy. If you start to notice a lot of bleeding when brushing then come along and see your friendly dentist and get your teeth checked. I hope this clears up some of the mystique around pregnancy and tooth problems. As always, any further questions please get in touch. Is your mouthwash staining your teeth? Do you use Corsodyl? 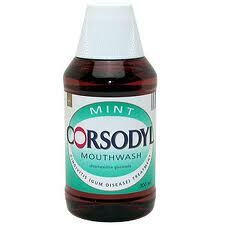 Corsodyl Mouthwash, aka Chlorhexidine Gluconate.. do you use it? Why? So whats the deal with Corsodyl, what makes it so difference to normal mouthrinses, like Listerine, Aquafresh, Colgate Plax etc..
Well, Corsodyl, has the active ingredient of Chlorhexidine gluconate (CG for short). Now this stuff, has got a VERY good track record on treating active gum disease. What this stuff does is actually stick to your teeth, gums, tongue and inhibit bacteria. Its fancy scientific classification is… “ a cationic bisbiguanide.” The CG opens up bacterial cell walls and kills them, less bacteria in the mouth, less inflammation, less gum disease. Thats the basics of it. However, there are side effects, these include discoluration of fillings and teeth, staining of your tongue, altered taste sensation, metallic taste and increased calculus/tartar formation. This is not a good thing. Interestingly, looking at the Corsodyl website, staining of the teeth is listed as a side effect, the recommendation is to brush your teeth really well to remove the staining. This does not work! The great ad campaigns from Corsodyl; If your eye bleeds, you’d see your optician, same thing for your teeth! Has led to alot of patients, self medicating CG mouth rinses. You can also go crazy, with mouthrinses, toothpastes, floss, and all other bits and bobs that go in your mouth under the Corsodyl brand. In my opinion, as a dental professional, Corsodyl is a great product but should only be used, if your dentist recommends it. There are lots of scientific studies, making CG a gold standard, for treating gum disease. But if you do not have gum disease should you be using it? If you notice a small amount of bleeding when you brush your teeth, ( which is very common!) dont self-medicate, come along and see your friendly dentist, and ask him/her do I need to use Corsodyl? Or are my gums bleeding because I need to brush better…. Comments Off on Is your mouthwash staining your teeth? Do you use Corsodyl?